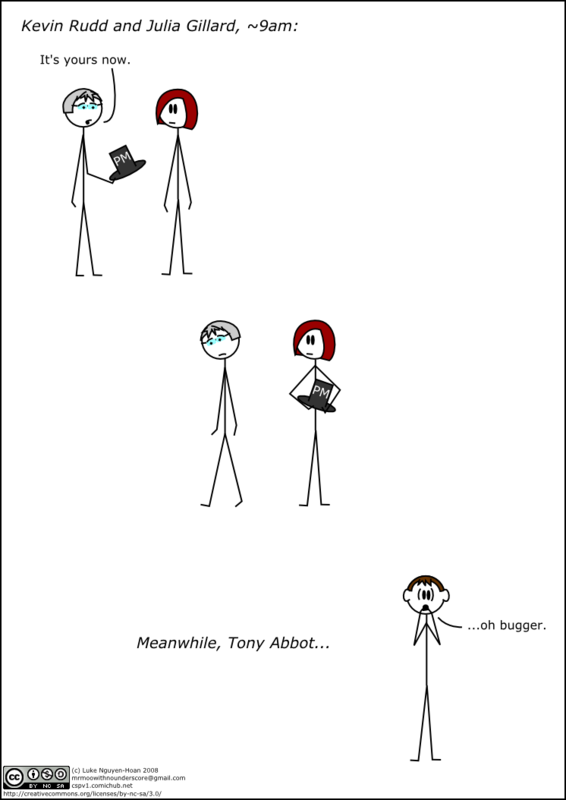 I imagine Tony Abbot's not _that_ worried, but with a significant proportion female voters likely to flock to Julia Gillard (at least, those who aren't already not Tony Abbot at any cost) the change in Labor (and Australian) leadership might pose a problem. Anyway congrats to the first female Australian PM commiserations to Kevin Rudd who now will never have a chance to fix what he did wrong and hopefully this all settles down and they can get on with _fixing the damn country_. That look on Kevin Rudd after handing off the hat is spot on.